Guilds on Tales of Solaris can accept special Guild quests up to twice per day. These quests are available at specific times of the day and offer players Guild contribution and EXP. To create a Guild players need to be level 30 or higher and pay a 10,000 gold fee, this can be done from the player interface by clicking on the Guild icon. 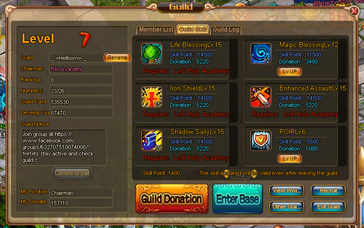 Guilds can also purchase and upgrade buildings, they can be purchased with the Guild donations from the Guild members. In addition Guilds can purchase skills with Guild contributions and skill points to give the Guild members buffs and bonuses. Finally there is the Guild shop that sells Guild items, it can be upgraded in order to purchase additional items.